In January we ran into Lowe’s to get a few things to fix our sprinklers and saw a great big, yellow CLEARANCE sign which is like a bright flashing light to me. Does anyone else remember the flashing blue light specials at K-mart or am I dating myself? So, OF COURSE I had to go over and check it out. 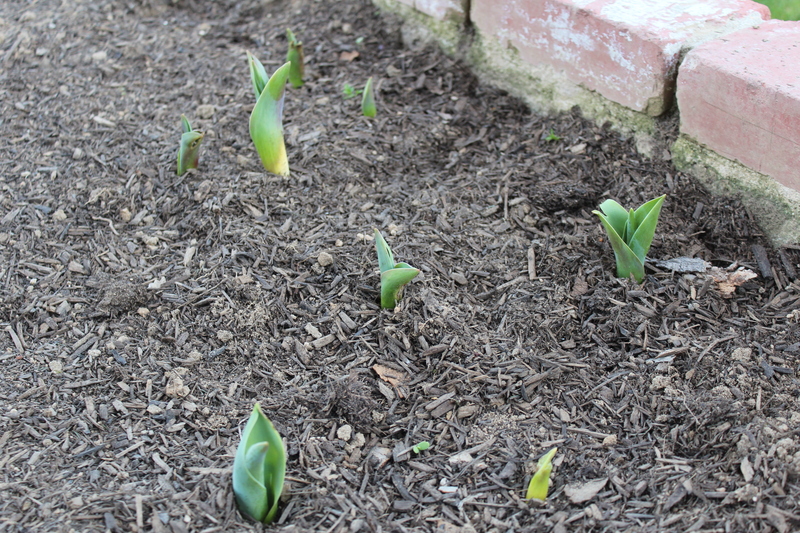 I found bags of tulip bulbs for $.25 and some of them were even starting to sprout a little green stem already. 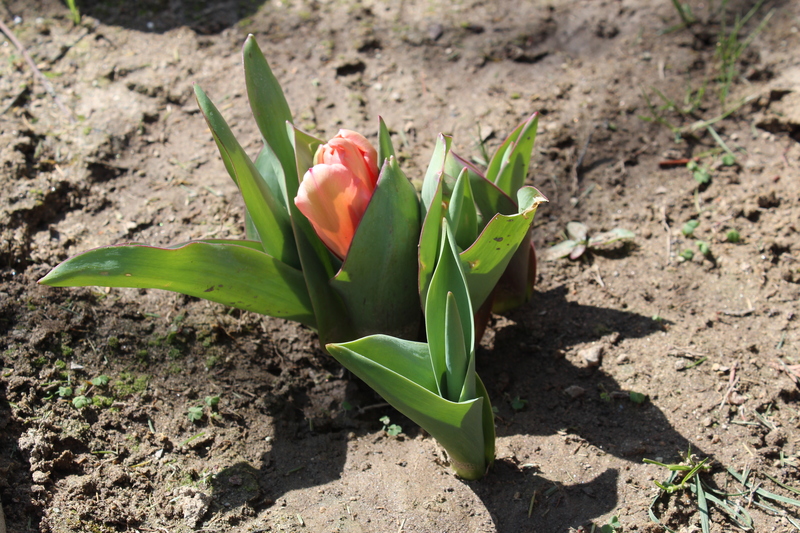 A master gardener may have advised that it was too late in the season to plant tulips and this was a terrible waste. This frugal mother of a boy that loves to play in the dirt saw priceless hours of digging to his heart’s delight for only $1.00 Who cares if they ever bloom! We’ll have fun digging and if we get a few blooms, bonus! I scooped up 4 bags of a different variety of tulips and checked out. The three of us with our shovels in hand started digging. If you have ever dug in the dirt with a child, you know how this goes. Scoop out the dirt in the hole deep enough for the bulb and then the child fills it back up. Scoop it out again and plop a bulb in quick and cover it back up with dirt, then my son digs it back up again with a huge smile on his face. Bring in the watering can and we had a bigger mess and more fun. Already well worth the dollar spent! He played hide and go seek with the bulbs and once they were all buried, my husband and I just laughed. Well, we’ll know where we planted them all if they bloom! The unseasonably warm winter here in California made for perfect growing weather for these little bulbs. Just 3 weeks later we started to see small evidence that a few may actually be growing or was it a weed? We needed to wait a few more days and then could it be? Yep, it was definitely the beginning! Isn’t that just how God works sometimes, underneath where we can’t see it and it feels like nothing is happening? Just when we have about given up, He gives us a little hope or perhaps a glimpse that he is working. Maybe not all at once like we expect, but in small ways reminding us He’s faithful and present in the midst of our struggle. It is often the struggle through the dirt and mess that something beautiful comes. Do you have prayers that feel like they have gone unanswered? Do you wonder if God is really at work? I do too, but I know even when I can’t see what is happening, I know God is at work and more often than not, it is my own heart He is changing. Just like that little bulb pushing up through the dirt, He uses our struggle to make something beautiful in us, if only we wouldn’t give up when life gets hard. I’m sure when you look back at your most difficult circumstances now, you see the beauty you may have missed in the middle of it. What are you pushing through in your life? Are you able to let God get you through it? Looking for more encouragement? 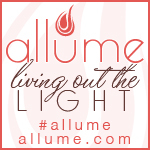 Head over to the The Better Mom and Women Living Well and say hi!